A new release from one of my favorite authors, and set in my favorite world! 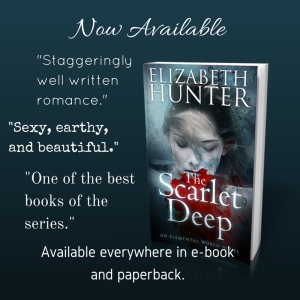 The Scarlet Deep is available today! Any time I ever question that feeling in my gut that tells me I need to take a break from a series or fictional world, I will think about The Scarlet Deep. I love this book. I loved writing it. I loved diving back into the world again. I loved sharing the excitement with my readers when I returned. It was over two years between Blood and Sand and The Scarlet Deep. I know some people probably lost interest in the storyline, and that’s their prerogative. But I didn’t lose interest, and that’s the point.